Camels beside the colourful buildings of Gharb Sohail, a Nubian village in Egypt. Courtesy Aya Nader. Located along the Nile River, in an area between northern Sudan and southern Egypt is what is left of the ancient Kingdom of Nubia. Here you will find ancient monuments, a displaced population and fresh attempts to bring a rich culture to light. One of the oldest and richest cultures in Africa, Nubia’s history can be traced as far back as 2,000BC. The last Nubian kingdom collapsed in the 16th century. 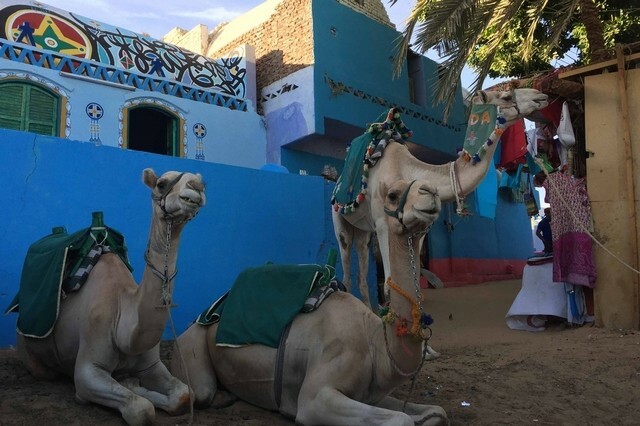 Now, one Nubian village in Egypt – Gharb Sohail – has become a major tourist attraction and many locals have turned part of their homes into guesthouses. Big halls, a mastaba (a traditional bench built into the wall) an area for women’s gatherings that usually take place after sundown, and a tea area, represent a typical Nubian living unit. Walls are painted with scenes from everyday life or nature. One of the traditional drinks is always at the ready: red tea with basil, hibiscus tea, or strong African jabana coffee. To reach Gharb Sohail, we travel to Aswan. From there it’s a ferry ride to the Nubian village which sits on a sandy hilltop – a colourful haven of houses painted in blue, yellow, green and red. "I just love how they open their homes for visitors, offering tea, henna and stories," says Leena El Deeb, a Cairo resident. Henna is an important part of Nubian culture. Prepared from the henna plant, visitors usually leave with tattoos of reddish-brown flowers and geometric shapes. In Nubia, a bride is covered from head to toe in henna art prior to her wedding. Nubians also traditionally made necklaces and bracelets from camel bones. Today, accessories, baskets, perfumes and incense fill the narrow tourist market, along with rows of colourful spices and weavers making pashminas. "Gharb Sohail has everything, from shopping at the souq to Nubian entertainment shows; the whole package. The people there are very kind and very hospitable," says Sarah Hany, another visitor from Cairo. Calling it "a place of inner peace", tourist Hagar Gamil enjoys being immersed in ancient tradition, be it among the people, their homes or history. Crocodiles are also a feature of village life. Floors are covered with flattened sand, especially at entrances. This is a tradition that dates back to ancient Nubia: each morning the homeowner checks for signs of crocodiles or snakes entering the house. Crocodiles were taken in as pets, and their pheromones repelled other intruders. Up to this day, crocodiles still live in some households, albeit a minority and for tourism. On my visit, I saw one in a stone cage. The Nubian village has attracted visitors for many years but locals believe the 2002 film Mafia, shot on Nubian lands, put the area on the map for Egyptians. Another advocate is Nubian singer "The King" Mohamed Mounir, who established a hotel there named after one of his songs Hadouta Masreya (An Egyptian Tale). Other figures in Egypt’s modern history hailed from Nubia, including poet and journalist, Abbas Al Akkad; former commander-in-chief of the Egyptian Armed Forces Hussein Tantawi; and former president Anwar Sadat. At sundown, Cairo resident Hamed Alazzamy says he goes to a rooftop cafe and takes in the scene. "I thought it was eye opening. To think that people could live so simply while the rest of us worry about silly things". But the history is not simple. In 1964, the Aswan High Dam was built, submerging villages and leaving more than 100,000 people homeless. Since then, Nubians have been calling for their right to return. Last year, a presidential decree designated a large stretch of land as a restricted military zone. The area, adjacent to the Egypt’s border with Sudan, includes 18 Nubian villages to which residents had hoped to return. Some people from other parts of the area settled in Gharb Sohail. With today’s population of half-a-million across what is left of wider Nubia, the new generation is well aware of the lack of exposure Nubia has. Their economy depends on the winter tourist season so they have created YouTube channels such as "Nuba Tube", mobile apps and social media platforms to keep the language alive, market their products and showcase their heritage. As Argentinian travel blogger Valentina Primo, who went three times in a year, told me, "You can find a family away from home; a place so filled with colour, nature, and a surreal sense of community that you won’t feel a stranger. It’s also a place where the Nile shows its best facade, where the sand burns under your feet, and children dance as contagiously as I’ve never seen". Aya Nader is a freelance journalist based in Cairo. A plank of wood believed to be from the boat of an ancient Egyptian king has been unearthed near the Great Pyramid at Giza, archaeologists say. The boat, which is the second such vessel to be found on the site, was believed to have been built for King Khufu who ruled Egypt during the fourth dynasty more than 4500 years ago. "We are celebrating the extraction of the largest plank of wood," said the project's main supervisor Mamdouh Taha, adding it measures 26 metres long. Archaeologists and conservation experts extracted the piece from a pit nearly three metres underground and moved it to a conservation centre located next to the discovery site. CAIRO — Egypt is inaugurating its largest on-site antiquities laboratory, to restore the second ceremonial boat of Pharaoh Cheops, known for building the largest of Egypt's iconic pyramids. 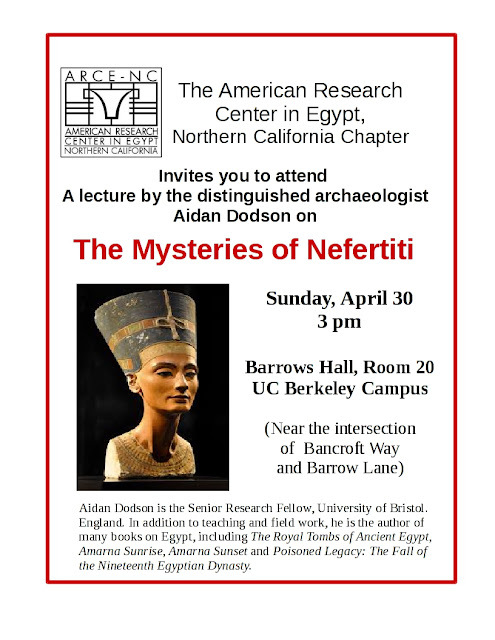 Aidan Dodson is the Senior Research Fellow, University of Bristol. Hosni Mubarak, the first leader to face trial after the Arab Spring uprisings that swept through North Africa is a free man after spending six years in detention. Legalbrief reports that the extraordinary development marks the end of a futile campaign to find him accountable for numerous human rights abuses during his term in office. His long-time lawyer, Farid el-Deeb, who has guided him through a tangled cluster of prosecutions since 2011, confirmed his release. Mubarak, who had been held at a Cairo military hospital for most of his incarceration, is recuperating at his Heliopolis home. Earlier this month, the 88-year-old was acquitted by Egypt's highest appeals court in the final verdict in a long-running case that originally resulted in him being sentenced to life in prison in 2012 over the deaths of 239 people in Arab Spring protests against his rule. The Guardian reports that a separate corruption charge was overturned in January 2015. For those who worked to topple the former dictator, Mubarak's freedom marks a grim moment in Egypt's modern history. Yet some reacted with little more than resignation as his release became imminent, numbed by the years of political turmoil since his fall. Mubarak's democratically elected successor, Mohamed Morsi, was overthrown in a popularly backed military coup in 2013. The report notes that many see echoes of Mubarak's style of leadership in Egypt's current leader, Abdel Fatah al-Sisi. 'The Mubarak acquittal is of significant symbolic value in that it reflects an absolute failure of Egyptian judicial and legal institutions to hold a single official accountable for the killing of almost 900 protesters during the January 25 revolution. It is indicative of a deeper, compounded crisis of transitional justice,' said Mai el Sedany, a legal expert with the Tahrir Institute for Middle East Policy. In a telling reflection of government's concern, Mubarak was released under conditions of secrecy and on the quietest day of the week in Egypt. The Boston Globe reports that state media said little about it. Even the loyalists who frequently cheered Mubarak from the hospital gates through the years were not told beforehand of his pending release, although they were no less jubilant afterwards. Although Mubarak faced a wide range of charges, he was eventually convicted on a single relatively minor corruption charge. The report notes that Mubarak's legal woes are not entirely over. On Thursday, a Cairo court created the basis for prosecutors to reopen a corruption probe into gifts that Mubarak received from a state-owned newspaper while in power. On 24 January, 2011, there were two constants in Egypt: the flow of the Nile and that Mubarak would die in office. After all, CNN reports that the 30-year rule of the country's 'Modern Pharaoh' appeared to be secure, shored up by the feared State Security. However, Egypt wasn't immune to regional events and the momentum leading up to the country's uprising started in Tunisia. Mubarak initially responded with violence. Hundreds of citizens around the country died in clashes with police. When that didn't work, the President tried concessions. Mubarak delegated powers to a vice-president, Omar Suleiman, and vowed not to run for re-election. Mubarak fled to his seaside home in Sharm El Sheikh. Authorities finally apprehended him after increasing public pressure. Egyptians were glued to their television sets when his trial began. Two-thirds of Egyptians never knew another President. For many, he was a father figure. Mubarak appeared in a hospital bed wearing white prison garb, sunglasses, and a scowl. The once strongman looked frail and bitter. The local press called the next 10 months the 'Trial of the Century'. In the cacophony of the courtroom, the judge called the former President an 'accessory to murder' and sentenced him to life in prison. The report notes that jubilation erupted outside the court and on the streets of Cairo. However, it wouldn't last long. Egypt wouldn't escape political and economic turmoil and the first democratically elected President would be deposed in a popular military coup. A report on the EWN site notes that many Egyptians who lived through his presidency view it as a period of stagnation, autocracy and crony capitalism. 'His release takes that journey full circle, marking what his critics say is the return of the old order to Egypt, where authorities have crushed Mubarak's enemies in the Muslim Brotherhood, killing hundreds and jailing thousands, while his allies regain influence. 'The economic crisis we are living in and the high prices take priority over everything, as does the fear of terrorism. That is what preoccupies ordinary citizens, not Mubarak,' said Khaled Dawoud, an opposition politician who opposed the Islamists but also condemned the bloody crackdown on them. 'When you see the group of people who show up and cheer and support him, you are talking about 150, 200 people,' he said, referring to occasional shows of support outside the Maadi hospital when Mubarak was there. The report notes that in the turmoil of the Arab uprisings, Tunisian President Zine al-Abidine Ben Ali fled into exile in Saudi Arabia, Libyan leader Muammar Gaddafi met an ignominious death at the hands of rebels and Yemeni President Ali Abdullah Saleh resigned. However, early hopes of democratic change in the region have eroded, the report states. OIC 13. Tell Asmar and Khafaje: The First Season's Work in Eshnunna 1930/31. Henri Frankfort, Thorkild Jacobsen, and Conrad Preusser. 1932. OIP 139. Early Megiddo on the East Slope (the "Megiddo Stages"): A Report on the Early Occupation of the East Slope of Megiddo (Results of the Oriental Institute's Excavations, 1925-1933). Eliot Braun, with David Ilan, Ofer Marder, Yael Braun, and Sariel Shalev. 2013. OIP 114. Nippur, Volume 4: The Early Neo-Babylonian Governor's Archive from Nippur. S. W. Cole. 1996. OIP 23. Medinet Habu, Volume III. The Calendar, the "Slaughterhouse," and Minor Records of Ramses III. By the Epigraphic Survey. Originally published in 1934. SAOC 67. Language and Nature: Papers Presented to John Huehnergard on the Occasion of His 60th Birthday. Edited by Rebecca Hasselbach and Na'ama Pat-El. 2012. SAOC 45. Thus Wrote 'Onchsheshonqy - An Introductory Grammar of Demotic (Third Edition). Janet H. Johnson. Third edition, 2000. SAOC 11. Epiphanius' Treatise on Weights and Measures: The Syriac Version. James Elmer Dean, ed. With a Foreword by Martin Sprengling. Originally published in 1935. Lost Egypt, Volumes I-III. A Limited Edition Portfolio Series of Photographic Images from Egypt's Past. Anyone Can Grow Up To Be President?